Everywhere you find effective communication you’ll almost certainly find the ABT at work. 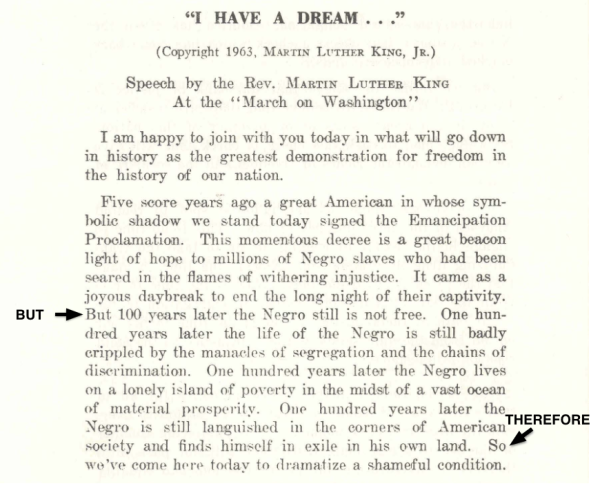 There’s a lot of reasons Martin Luther King, Jr’s “I Have A Dream …” speech is one of the greatest speeches in American history, but one of them is strong narrative structure. Look how it opens — pure ABT. CLARITY OF MESSAGE. Yes, it is that simple. He could have gone off in ten different directions right from the start, but he didn’t. After an opening greeting, he delivered three sentences of exposition, then got right down to business, stating the problem followed by a statement of consequence. It’s kind of hard to say which part of a narrative is most important. If you confuse or bore people at the start, you’ve lost them. If you don’t close well, the whole effort can be a waste. And it kind of helps to not make a mess of things in the middle. But in a world of short attention spans, it is increasingly crucial to have a strong opening. People are making their minds up whether to listen from the start. Lots of people over the ages have analyzed MLK’s great speech. There’s tons to praise in it, and given the seriousness of the moment and enormity of his audience in front of the Lincoln Monument, he pretty much couldn’t go wrong. But regardless, it still mattered whether he bored, confused or drew the audience in from the start. By opening with solid ABT structure, he guaranteed the latter. Once you recognize that the speech opens pretty close to perfectly with solid ABT structure, I think it’s worth conceding that the rest of it, while powerful and effective, isn’t so air-tight for narrative structure as to deserve the label of “perfect.” What is good is the basic messaging of using a lot of repetition. About two thirds through he hits a stretch where he starts eight consective sentences with “I have a dream …” That’s a little bit “And, and, and-ish,” but that’s okay. By that point he’s hammering home his message through repetition. What’s worth considering is that there might have been a story he could have told. As great as the speech was, there could well have been an even better, more powerful version with tighter narrative structure. Who knows. That’s the thing about the narrative challenge — you can never prove that there doesn’t exist a better version. But the key point is that MLK had deep narrative intuition, and that showed itself by how he opened the speech. He started simple, drew his audience in, then let loose with the exhortations they needed and wanted to hear. In my next blogpost I’m going to go to the opposite end of the spectrum by looking at what is considered by many scholars to be the worst speech ever given by a U.S. President — Jimmy Carter’s 1979 speech on malaise. Guess what he opens with — a defective ABT mess that is basically a “double but” situation. Ugh. Case in point.